They say the way to a man’s heart is through his stomach. Joe would prefer breakfast over any meal. He’s an early riser and I’m not a morning person so he rarely ever gets a hot breakfast first thing in the morning. I frequently make breakfast for dinner because I know how much he loves it. 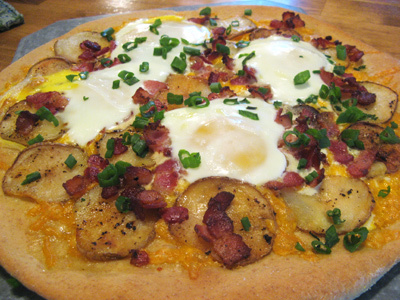 This pizza has bacon, crispy sliced potatoes and eggs over a layer of cheddar cheese that’s good any time of day. Take 6 slices of bacon and slice into bite size pieces. 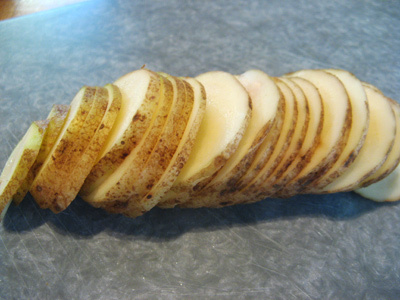 And thinly slice a potato. I left the skin on, but you can peel first if you want. Also I used 1 medium potato per pizza. 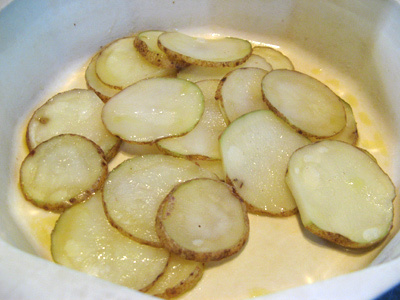 Place the potatoes in a microwave safe bowl and drizzle with olive oil. Microwave on high 2 minutes. At this point they will be starchy and soft. I cooked the bacon pieces first in a non-stick skillet, then set them on a plate lined with a paper towel . The bacon was lean and not much grease left to cook the sliced potatoes so I added a drizzle of olive oil to the pan. The potatoes only needed a couple minutes on each side to crisp. Once cooked, add them to the plate along with the bacon. 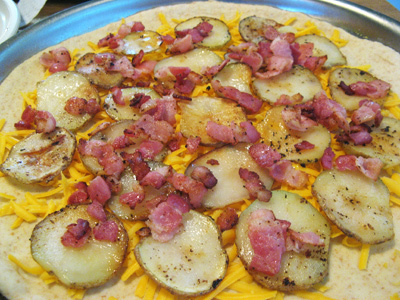 The bacon and potatoes are cooked and the cheese is shredded. I divided the dough into 2 halves. I rolled it out and placed it in the pan. 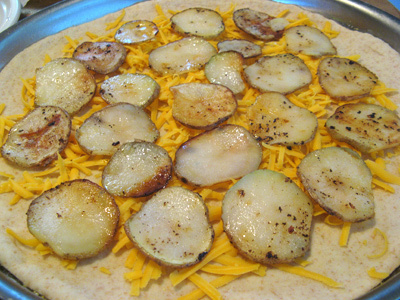 Add a layer of cheese and potato slices. 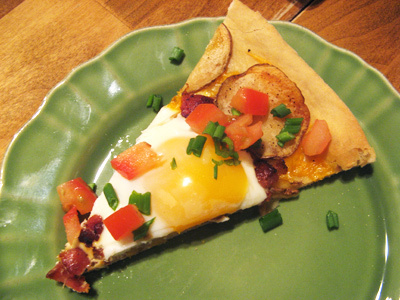 Crack 4 eggs over the pizza. Get the 2nd pizza loaded up and pop in a 425 degree oven for 12 – 13 minutes. I sprinkled a little green onion over the top. And a little chopped tomato too! Yum! Make dough (recipe included below) or use store bought. Microwave potato slices in a microwave safe bowl for 2 minutes. Set aside. Cook bacon in a non-stick skillet over medium high heat. Stir with a wooden spoon to separate bacon pieces and cook until crisp. 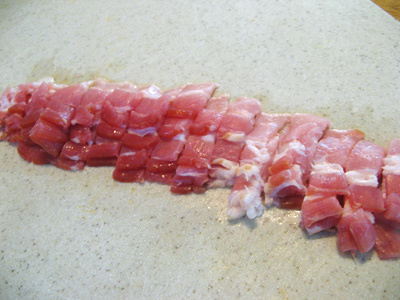 Transfer bacon to a plate lined with a paper towel. 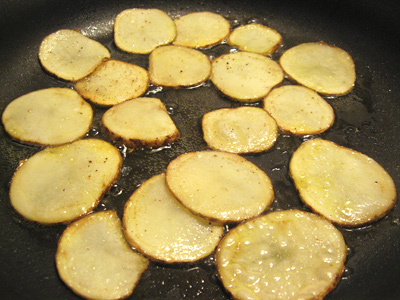 Using the same skillet lay the potato slices in the pan in a single layer. If needed, add a drizzle of olive oil to the pan. Cook 2 minutes on each side or until potatoes have started to crisp. 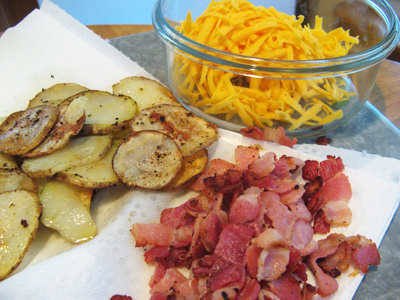 Add potato slices to the plate with the bacon. Assemble pizza by placing dough in pizza pans. 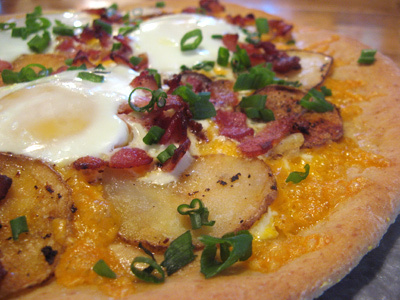 Layer with cheddar cheese, potato slices and bacon. 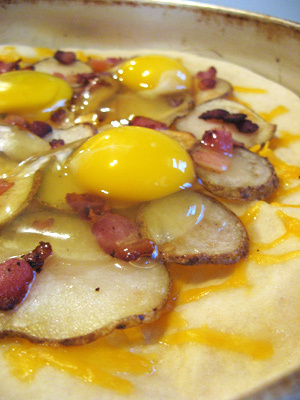 Crack 4 eggs over each pizza. 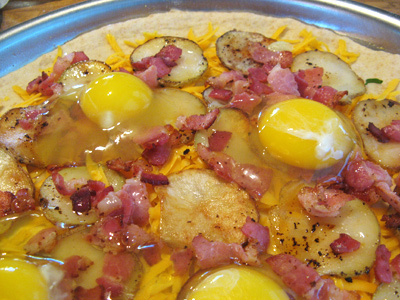 Place in a 425 degree oven for 12 -13 minutes or until crust is browned and eggs are set. Sprinkle green onion and diced tomato over top if desired. In a large bowl, combine hot water, yeast, salt, sugar and olive oil. Set aside until yeast starts to get foamy. 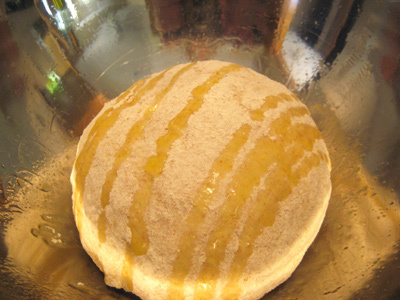 In another large bowl, mix together the flours. Add the flour mixture to the yeast mixture a little at a time and stir with a wooden spoon until dough forms and pulls away from the sides of the bowl. Transfer to a large bowl lightly drizzled with olive oil. 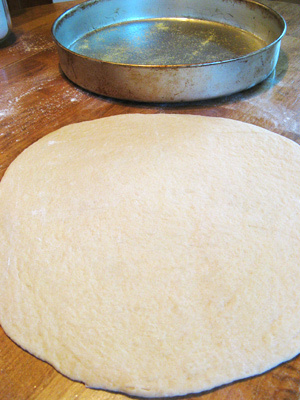 Drizzle on top of dough and cover with plastic wrap or a dish towel and place in a warm area for half an hour.